To help that special “New Year feeling” come faster, make everything in your house look festive. Every winter we decorate our homes, wishing to give both ourselves and our loved ones a feeling of something new. But there’s no need to rush to the store for toys, candles and garlands — you can create holiday atmosphere with your own handmade decorations. To make New Year’s Eve truly special, dim the lights and arrange candles around the house. Feel free to make your own: use jars, flower pots, and cones; maybe even spice things up with few cinnamon sticks. Try handmade approach with Christmas decorations as well: using clay or playdough with addition of felt or velvet, shape and sew a couple of simple toys. Don’t like sewing? Not a problem. Glass balls and old light bulbs can be made into ornaments too. For this, cover the surface of a ball or a light bulb with glue and roll it in a plate full of glitter. Christmas lights are guaranteed to create festive mood. For the best atmosphere, hang them literally everywhere: on the stair railings, ceilings, walls and cabinets, along the doorways and, of course, on your Christmas tree. Make simple garlands yourself, out of paper or foil. A miniature Christmas tree made out of cones, buttons, lace, yarn or colored stickers will be an adorable decoration piece. Adorn it with sparkles, beads and ribbons and it will provide tough competition for its fellow conifers. Don’t forget to decorate your windows with hand-drawn ’made by snow’ patterns. To do this, cut out templates using thick paper. Mix toothpaste with a dash of water as paint. Then, simply put the toothpaste mixture on each template and stick them to the window. If you are looking for a fresh, new way to decorate your home for the upcoming holidays, bake fragrant ginger cookies. Before putting them in the oven, don’t forget to make two small holes in each cookie using a straw. When your cookies are baked and cooled off, thread ribbon through the holes and treat your house to an original edible garland. When decorating a Christmas tree, don’t limit yourself to tinsel, garlands, and toys. A few printed family photos peeping out of fir needles will make your holidays even more unique to your family. Don’t forget about making creative New Year decorations for the children! Simply fill small glass jars with toys and miniature Christmas trees and add ‘snow’ (rice or cotton). You can make festive winter decorations out of anything. And, yes, that includes old scarves and jumpers. Tightly wrap each Christmas ball ornament in woolen fabric, then secure the fabric at the base of eash ball with ribbon — that’s it! Hang these little wooly guys all around the house and enjoy. This year, use tangerines to garnish both your festive table and Christmas tree. Put the fruits in plain plywood boxes lined with kraft paper for a week or so. When the tangerines have dried out, decorate them with ribbons, cinnamon sticks, and cloves. There you have it: simple and full-flavoured ornaments that will never go out of style. Classy Christmas ball ornaments will look great dangling from suprising places like windows or chandeliers. All it takes is a bit of time, inspiration, and few colorful ribbons to hang them on window ledges or door-handles. A small apartment does not necessarily mean Christmas sans the tree. Turn this Christmas tradition into a drawing or a fetching mosaic on a wall! Use paint or an arrangement of simple little objects for a truly ‘artsy’ effect. Don’t forget the dinner table: start by adding a fancy table runner to your usual tablecloth. Basic linen napkins can be dressed up with a little sprig of evergreen or folded into a Christmas tree or a cute snowman. Complete your table setting with scented candles and a Christmas wreath for the centerpiece. Turn your boring drinking glasses into magic goblets worthy of seeing you and your loved ones off into the New Year. Just add a couple of bright, silky ribbons and you’re good to go. For a bigger creative challenge, try to color the glasses with acrylic enamel paint. Let them dry for an hour and then bake in an oven at 350°F for 30 minutes to set the paint. Turn off the heat and allow the glasses to cool in the oven. Congratulations, you are now a proud owner of a very unique Christmas-themed drinkware set! 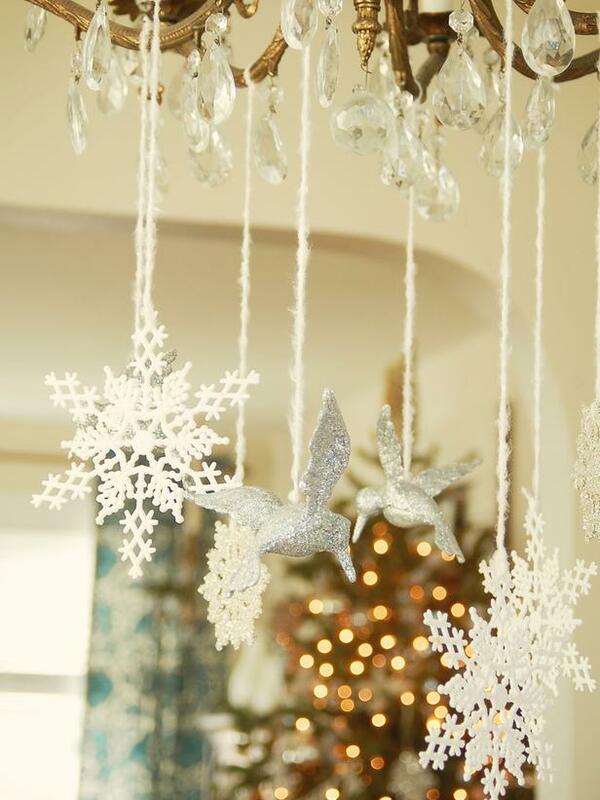 Elegant Christmas decoration can be arranged out of ordinary tree branches. Spray paint them silver and fasten them to a chandelier or curtain poles. Now decorate the branches with few ornaments and feel the holiday juices flowing!